“Dragged Across Concrete” is the third film by the director, S. Craig Zahler. His first feature film came out in 2015, “Bone Tomahawk”, and then his second “Brawl in Cell Block 99” in 2017. Both really good movies, that shows the director perspective about the world and his visceral realism. This year, he is back with his third feature, but it also comes with the question, is “Dragged Across Concrete” as good as his previous two movies? No. 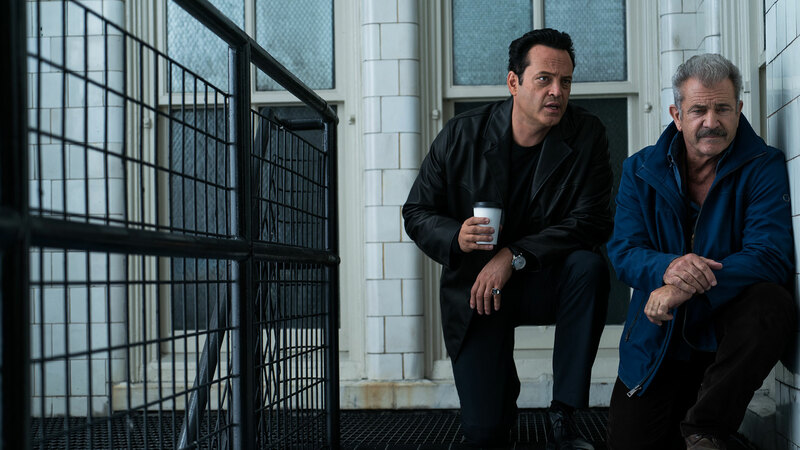 “Dragged Across Concrete” follows the story of the veteran cop, Bret Ridgeman, played by Mel Gibson and his partner, Anthony Lurasetti, played by Vince Vaughn. The two cops got suspended after a violent video of them went viral. Struggling in life, Bret and Anthony decide to enter the criminal world to find a way to help their beloved ones. Directed and written by S. Craig Zahler, the author is back with his third feature film, if you have seen his other two movies, you might have an idea of what to expect. Blood, violence, blood and more violence. The writer-director has a very violent perspective and he does not mind at all to show all the gore. Which brings a lot of realism to his movie, which personally, I enjoy. His movies have this feeling that there is no such thing as a happy ending. The movie has a very dark approach, with dark lights and the score is nonexistent. The director want us to feel the characters and theirs struggles, rather than induce us to feel something. His characters are based on dilemmas and struggles in life. Mel Gibson and Vince Vaughn play cops, which are racist, brutal but still are sensitive with their personal life. Mel Gibson plays a cop who have been working for a long time, but things do not seem to change, stuck in a job because of his methods. And Vince Vaughn a much more younger cop, who has been to the World, and different from Mel Gibson’s character, he is more sensible. Henry Johns, played by Tory Kittles. Who starts as you thing with a small role, but as the movie goes on, you can understand his motivations and turns out to have a big role to the story. However, with some interesting characters the movie feels a little bit predictable, with characters that come and gone and you can not create some type of connection or even with the story itself. The movie is over two hours long, making the longest film made by the director. It has a slow second act, where it tries connect us to our main characters and sympathize with them. However, it is very long and slow, giving us a different approach from his last two movies, which have more blood and violence, and still have better characters. “Dragged Across Concrete” turns out to be better than I expected with a twist at the end, the movie is not as violent as his first two movies, but it is very violent when it needs. With some predictable and flat characters who do not learn or even evolve with their own dilemmas, the movie talks about trust and the desire of a better life.